Starting tomorrow, June 10th, Casino Luck is running another promotional week with free spins, bonuses and the chance to win a Samsung Galaxy Tab. 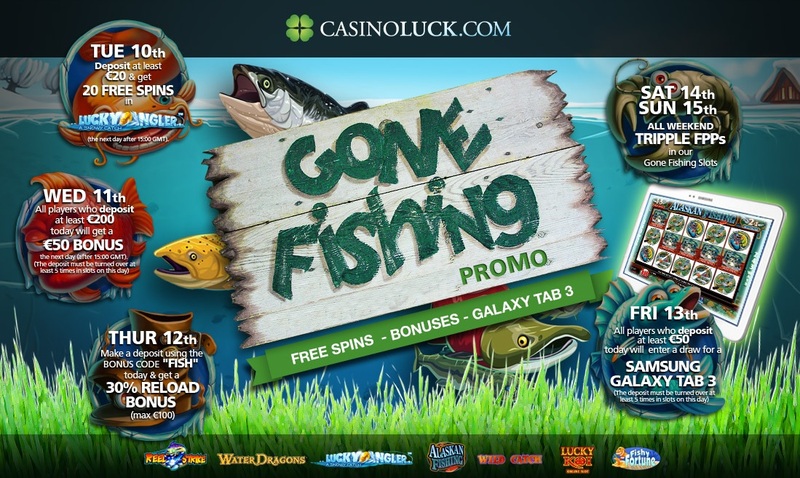 This time the people at Casino Luck have chosen “fish” themed slot games for their promotional week, hence the name Gone Fishing. And surprisingly, there are a lot of fish-themed games out there. The games that qualify for this promotion are Reel Strike, Water Dragons, Lucky Angler, Alaskan Fishing, Wild Catch, Lucky Koi and Fishy Fortune. Below a full list of the daily promotion. Tuesday June 10th. Deposit at least €20,- today and get 20 free spins on Lucky Angler the day after. Wednesday June 11th. Deposit at least €200,- and receive a €50,- bonus. Thursday June 12th. Deposit and use bonus code “FISH’ for a 30% reload bonus up to €100,-. Friday June 13th. Deposit at least €50,- today and enter a draw for a free Samsung Galaxy Tab. Frequent player points are earned by playing any game at Casino Luck and can be traded in for cash at any point. Casino Luck offers over 600 different games from NetEnt, Microgaming, Play’n Go, Nextgen Gaming and even IGT and Betsoft.